Ohio State Football: Kerry Coombs Named Top Recruiter And Why Not? Ohio State coach Kerry Coombs was named Recruiter of the Year by Rivals. Kerry Coombs is recognized as one of the best cornerback coaches in the nation as he continually sends Ohio State players on to the NFL. Now he has been named Recruiter of the Year by Rivals. 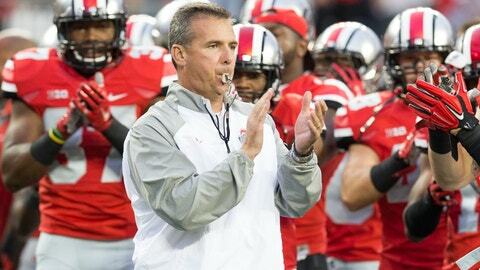 Coombs has been an outstanding recruiter for Urban Meyer since he arrived at Ohio State. In this year’s class he outdid himself. In an article by rivals.com they explain why coach Coombs was selected as the top recruiter this year, and his accomplishments are impressive to say the least. He was the lead recruiter for Isaiah Pryor, Marcus Williamson, Amir Riep, Kendall Sheffield, Jerron Cage and Blake Haubell. He assisted on a few other players as well. In the article, the coach discussed how he developed his recruiting style, the 2017 class, Urban Meyer etc. Here is what coach Coombs said he learned from his players being recruited during his many years at Cincinnati Colerain High School. Coach Coombs went on to give a lot of the credit to Urban Meyer and the rest of the staff, as well as the players themselves. While recruiting is definitely a team effort at Ohio State, the cornerbacks coach’s contributions are significant to say the least. It’s not difficult to understand why Coombs is as successful as he is on the recruiting trail either. Nearly every recruit comments on how much he enjoyed his time with the coach after a visit. His players on the team love him, and you know the recruits are talking to them about their experience at Ohio State. If that isn’t enough, coach Coombs sends his players to the NFL. Playing on Sundays is on the mind of every star recruit. Each of his first four years at Ohio State there was one cornerback selected in the NFL draft. This year Marshon Lattimore and Gareon Conley are expected to be high draft picks. Don’t you think that makes an impression on a recruit? Don;t expect things with the cornerback situation for the Buckeyes to change anytime soon. With the young talent already on the roster, as well as the terrific defensive backs in the 2017 class, you can expect even more Ohio State corners to be playing in the NFL in the next few years. That’s almost a certainty when you have an outstanding cornerbacks coach who is also the top recruiter in the country.